Sai Baba's greatness is unfathomable, so are His wonderful Leelas.Who can describe Baba's boundless love !! No one -only we can feel it by totally drenching ourself in HIS love and devotion . Todays Sai leela gives us message that when anyone wishes earnestly with heart and soul to be at Baba's place and receive HIS blessing ,Baba also blesses HIS child's desired wishes in all possible ways .Sai Baba's all pervasiveness is experienced by His devotees all over the world,every second and is also felt by Sai devotee Ashalatha sister in this leela . Our humble prostration to all-pervasive Sadguru Shri Sainath .Please read the leela given below in detail by Ashalatha sister.Jai Sai Ram . I know fair well that I am really sending you a very long post, I am sorry that’s the way Sai wants it I can only add more to this and not cut short. 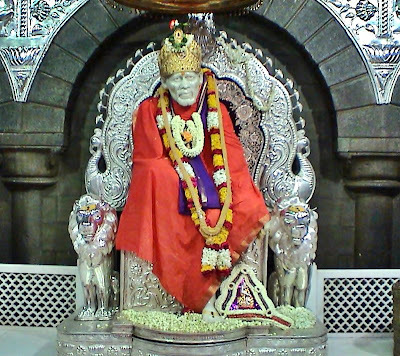 Sai blessed us to have his darshan in Shirdi in the month of June.We were so excited and happy about the trip all the bookings were made well in advance with the consent of our Sai. When we landed in India the first great news I got from my B-in-law was that the flight to Pune is rescheduled and the take off is an hour earlier to Pune from Chennai and similarly the return is delayed from Pune by one hour or so.I was so happy that both ways I get more time to be in Shirdi. Just a day before flying to Shirdi there was a mail from a blog “Heart longs to go to Shirdi” here is the complete 360degree inside view of Samadhi mandir of Shirdi”. I was just viewing the Samadhi mandir and could not stop imagining that we will be in front of our eternal father in another 24 hrs. Everything was very fine and I was in my own Sai world. I was recalling our previous darshan in Shirdi. We were nearly 10 members including 4 kids. Few members in the group were having a thought of going to Ajanta /Ellora and then reaching Shirdi.I was so upset about this because that day was a Wednesday - Purnima, I wanted to see my Guru on a purnima day and moreover I had been craving for Sai for the past 4 years and I could not just imagine going for any sightseeing. I could not interfere and finally told my husband please let us book two different vehicles and all those who wants to have darshan let them join us. Finally everyone said we will keep traveling until lunch time and see where we reach and then decide . We got a jeep and we started to move, each and every second was like an hour for me. I was just praying to our Sai to change all their minds by lunch time. Frankly speaking I never felt hungry /thirsty. In hotels I was feeding my kids and was pretending to give company to others. I even requested my sister to take care of the kids because I don’t know,I was not interested in conversation with anyone nor was I interested in having lunch ,I even did not want anyone to touch me, don’t know sometimes I get such strange feelings . (My sister and my husband understood me well and they really left me in my way. (My hearty thanks for them). One of the kids had travel sickness and so he was throwing up and had completely exhausted by lunch time and so all the members felt that it is not advisable to strain the kid and decided that we will go to Shanishinganapur and from there to Shirdi. My happiness knew no bounds,I thanked my Sai for this and at the same time prayed to SaiMaharaj to make the child healthy to have Sai’s darshan.We reached Shanishinganapur and I was like can’t stand or sit anywhere just want to step in the holy soil of Shirdi. We went for darshan no words to express my feelings,” It was unbelievable that I am standing in front of my Saima in Samadhi Mandir, I cannot remove my eyes from the divine eyes, totally lost in Sai, Sai the prettiest, the glow of the golden throne on Sai’s white marble idol was really a blissful scene, I was not even realizing whether I am walking or somebody is carrying me and showing the heaven on earth. I was in divine ecstasy. The flower arrangement in Samadhi mandir was just incomparable. We handed over baba’s shawl in the office and came out of the mandir and we headed towards Dwarakamayi for the ShejArati. We all got to sit in the lap of our Saima and did arati of our Sai. 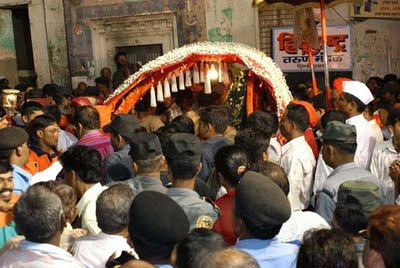 We got to hear that Sonia Gandhi was to visit Shirdi the following day in the afternoon, I felt so upset about this imagining the tight security and I was praying to Sai to bless us to have darshan without any disturbances. So all of us wanted to finish our shopping that night. A friend of mine had asked me to buy Sai pratima with full set like Sai with shawl, jewels and padukas, I found Sai in red color shawl when I was buying for her I just loved to buy one Sai for me also but by then since I was already having 2 pratimas at my home and I was trying to keep my wish to myself and was saying Sai, may be in future when we settle in India I can buy . My sister and others were also buying Sai arati books, Pratima and SaiSatcharitra for their friends. It was Thursday - Sai’s day. Early morning I and my sister all alone went to Dwarakamai (really Sai gave that courage )and we were there for Kakad Aarti , Bhajan, Mangal Snaan , "Shirdi Majhe Pandharpur and my longing of chanting Vishnu Sahasaranamam was also fulfilled by Sai on that day. While we were in Dwarakamai a devotee looked like a local resident of Shirdi he was tall, wearing white robe, orange cloth tied on his head sat just in front of us and started singing bhajans on Sai with a loud, clear voice full of devotion, it was so nice to hear him, we were in a different state of mind not knowing or remembering about anything else. We went to darshan of Sai to Samadhi Mandir, Chavadi, Hanuman Mandir and it was so nice to have darshan that too in the morning hours the atmosphere is so nice. We came back and made the kids get ready and we all went to join “Sai’s abhishekam” when I saw the priest I was so happy because I had been seeing him always on you tube arati” links. The way he conducted the abhishekam is still in front of my eyes. After this we went to “Sai Satyanarayana pooja hall and we offered our pooja. After taking the Prasad and distributing to the devotees when we came in front of “Dwarakamayi” it was just time for “Madhyana arati” At any cost I want to be there for arati, except my sister and her mother-In- law all others wanted to go back to hotel they felt anyway we are not getting place inside so what is the use of standing outside. We could not get into the ‘Q’ as it was too long so we just stood in front of the railings ,many devotees where requesting the security to let them inside and what a miracle the security who was there until then just went somewhere and we three just flew inside “Dwarakamayi” and the most amazing part is there was just place for 3 of us to sit that too under the fan so comfortably, and we did noon arati. Literally tears were rolling down when I was singing the arati what a blessing from our Sai. (Sai want us to be inside and I felt he must have sent the security somewhere for that few minutes). We had requested the hotel owner to prepare some Prasad to be distributed after the pooja and when we came out of the mandir he kept Prasad ready and said that the Prasad had been already offered to Sai in Dwarakamayi and now we can distribute to other devotees. I felt so happy to see my husband sitting in front of Dwarakamayi and distributing Prasad, really these were the scenes which I had longed to see and Sai has implemented so well. (We had actually requested the hotel attendant to distribute Prasad but since we came late from mandir the attendant was not there and so they gave the big vessel of Prasad to us to distribute in our own hands). After lunch we all went to offer incense sticks to Dhuni, had darshan in Dwarakamayi, Gurusthan, Book stall, Sansthan office to get the blessed shawl which was used for Saimaharaj, Lendi Gardens, Nanda deep, Well used by our Sai, Hanuman Mandir, Chavadi, Shri Lakshmibhai Shinde’s house and exactly it was the time for Dhoop arati. All the others were exhausted and so they went back but I wanted to just stand in front of Dwarakamayi and so I stood with few other devotees and just closed my eyes singing arati imagining those golden years,” when Sai was in blood and flesh (as mentioned in Sai Satcharitra) Sai used to stand and bless by placing his divine hands on devotees and I was just imagining the same blessings of Sai on my head, as we were singing the arati, we were reaching the last song i.e. ”Ruso mama priyambika” I cannot sing this without the book and I wasn’t carrying at that moment. I was just trying to see whether there is anyone with arati book .I saw one boy was there with the book on my left side and a devotee was in between us so I could not peep through the book so I was saying to Sai, Sai please if the boy would be to my right side I can share the book with him, what a wonder exactly at the beginning of the song that boy just moved and stood on my right side and I was able to share the book and sing arati completely. As soon as we completed the arati a devotee distributed Prasad (sweets) and I could share with that boy and we both felt thankful to each other.This Must be Sai’s plan. Now I was waiting for one of my hearty day dream to come true, yes, to see the “Chavadi Procession”. Sai blessed us to have a clear view of the complete procession the drums, flag, dance performed by the kids, palanquin, flowers, fire work, the preparations were really heart touching one needs 1000 eyes to watch and the devotees were calling out at the top of their voice “Sai Maharaj ki Jai” I am sure that must have reached the skies. Infact when the procession was reaching Dwarakamayi the devotees were saying “Sai has come, Sai has come,” they were very clear in their thoughts they did not feel that Sai’s photo is coming/padhukas they all felt that Sai is coming, What a great feeling to be in the midst of such devotees. Sai only wants that pure devotion and faith from us. We saw Sai covered with mosquito net and being put to sleep on T.V. and came back to the room. Since early morning till 11.30 p.m. we were on the roads of Shirdi, I was not at all feeling tired my mind, body and soul was filled with Sai. Until then we did not even remember or feel that a VIP has visited the place where we were since morning till night. Thanks to all those who made it possible. It was the FINAL FRIDAY- BLISSFUL, BLESSED AND HAPPIEST AND MEMORABLE DAY IN MY LIFE. When I just woke up Oh my Sai, only then I remembered now the painful part has come Yes, I have to bid bye to my Sai. It was so painful for me even to think that I have to leave Shirdi in few hours, My heart started to weep, I felt my heart becoming very heavy, I cannot contemplate this pain with any other worldly pains, I don’t know whether I will get chance to go for darshan but somewhere I had a strong feeling that I should have the glimpse of my Sai before leaving. So I just got ready fast did some packing and when my sister was packing she had a bunch of roses when I asked her she said yesterday ,"I offered to Sai wanted to tell you but you are not even walking with us you are just running so could not tell you,” I thought Oh Sai, last year I offered this kind of rose bunches this year though we had offered a garland I liked those small roses and thought may be next time Sai will let me to offer, and was getting my kids ready and at one point my husband could make out that I am not happy and so he asked what is wrong with you immediately I said , please I want to see Sai once, he understood me , he said see we hardly have 20-30 mts left and the car will be ready so try to come back before that . He said - go and stand in the ‘q’. I said-I am leaving to my place in few minutes, I just want to have a final glimpse of Sai. Sairam, really our baba must have told him to let me; He let me in (thro’ the exit gate) I really wanted to touch his feet and only did a pranam and ran inside. I went inside and just stood in front of the big Portrait of our Sai, close to the holy stone. Controlling my tears I started talking to my Sai, heart to heart Sai, You really blessed all of us and gave a very good darshan and helped to offer all our prayers and pooja now my Sai, I am leaving please bless all of us and I don’t know when you will call me for my next darshan. She asked me - What happened to you? She- You look very upset what is your problem? I - I am leaving to my place now, leaving Shirdi. She- Oh you have come from such a long distance for Sai’s darshan, good. She said- “Jhor se bolo SAIMAHARAJ KI JAI” (chant loudly) look at Sai and tell him you will come very soon for darshan, You should leave from Shirdi happily. “I leave it to the devotees to imagine what a blessing it is to get a coconut, flowers and such assuring words in Dwarakamayi, when I am waiting for Sai’s blessings.” How merciful our Sai, inspite of so many thousands of devotees flocking for darshan he took his precious time to send someone to console me and give such a blissful sendoff to me. I was frozen for a minute, I did not know what was going on in my body at that moment, I felt so happy I did not know how to thank her, No doubt that Sai had made her do all this to me, I felt so thankful to her that moment she was Sai to me and did my pranams to her. I am preserving them in my mandir. (I wanted to offer rose bunches to Sai, whereas Sai gave me as a blessing). This clearly shows that our Sai is Omnipotent and he just fulfills each and every heart felt prayers and made us feel his presence. I would have never dreamt in my life to get this kind of send off in Dwarakamai. I just ran back to the hotel and was so happy and thankful to my husband for giving this opportunity and shared to my hearts content, never I had the pain that I was leaving my Sai ,I only felt that I am leaving my mom’s place and will return as per his wish and felt so blessed. We were just cleaning up the room, and my sister just then found a small parcel packed with newspaper, kept behind the T.V. she said hey, just look at this, Oh what a miracle again, I got goose bumps Yes, We found small Sai’s pratima being rolled and kept in the newspaper, and when we opened the packet we found that the pratima was broken from the lower back of our Sai till the asan of Sai, we guessed the devotees who occupied this room before us must have bought and since it broke they must have left it here, but I cannot leave my Sai there, I immediately took my Sai from my sister and told her its okay if Sai’s pratima is little broken I will try to fix and keep my Sai with me. (She was also feeling happy for me as she bought Sai’s pratima and I did not buy one yesterday). Now I glued and this pratima of our Sai is decorating my mandir and blessing our family, the jewel set, the crown which I had bought the previous day of getting this Sai exactly matched this Sai and not the pratima I had at home. Sai knew that he is going to come and so he made me buy before hand .And my wish of having a Sai in shirdi was also got fulfilled. I think the happiness I reaped now was thousand times more than I could have reaped by buying in the shop. I feel Sai wanted to come to our family this way. Now we headed towards Tryambekshwar and just then I remembered that I forgot to offer dry grapes (raisins) to Sai. I was thinking how I can fulfill this wish and at that moment my aunt called on our mobile from Chennai to find out about our darshan. I narrated her all the blessings of our Saima and told her about raisins she immediately said, don’t worry even this wish of yours will be fulfilled very soon, as a group of devotees have booked ticket to shirdi (from Poonthandalam baba temple) for next week and as soon as you reach Chennai you can request them for the same. I felt so happy and thanked my aunt and my Sai wholeheartedly for this blessing and after reaching Chennai when I spoke to Ramananji’s wife ,"I told her sairam, can you please offer raisins for my Sai in shirdi" the reply was, “sairam, please tell me how much you want to offer, if you want us to carry from chennai we are ready or you want us to buy in shirdi we can do, we are ready to carry anything for our Sai at our back. " I was immensely pleased by her reply and requested her to buy from shirdi and see our Sai’s plan before I could come back to U.S. Sai made us to visit Poonthandalam baba and I could also get the raisins which were offered to Sai in shirdi as Prasad. Manisha sister I am busy writing my this leela and my aunty is calling today from Chennai to tell me that she has been called by Sai for darshan and they are planning for April 8th, and she is again accompanying with devotees from Poonthandalam baba mandir. She is so happy about it and I am really feeling so happy and just longing for Sai to call us. When we went to Panchavati I was saying to my Sai, Sai will I get a glimpse of your face here and again Sai answered my prayer, I just stepped inside the Ram, Lakshman, sita temple and there was a big portrait of our Sai blessing all of us. Now everyday I recall my Shirdi trip, it brings lot of happiness and peace of mind. My mind doesn’t have much time for any other thought, during every arati there is something nice to recall and a bliss which I can only experience and no words can express to its fullest extent. I felt as if I had been to my mother’s place where in you get all your petty/big wish being fulfilled and when you leave though its painful we come out with the hope that we will meet them soon and we keep cherishing those lovely moments, ofcourse the blissful darshan and each and every miracle cannot be expressed by a human mind like mine with lot of limitations so I have left it to the holy feet of our sainath to narrate the same. I always wish and pray that Our Sai Maharaj should be with all of us, guide us and bless us always with such blissful experiences. An Appeal/hearty request to the shopkeepers in Shirdi and world wide- When I was in one of the shops close to Sai mandir, a devotee who came to buy Sai pratima was asking the shop keeper whether the pratima is fragile (breakable) the shopkeeper immediately tried to bang the pratima on the glass shelve to show how strong it is. I just could not bear that and immediately told the shopkeeper please don’t do that. I just request the shopkeepers please you can have a stone which is of similar nature of the stone used for making Sai’s pratima and do all the proof showing on that and please not on the pratima itself. I want this to be brought to the notice of the Sai Sansthan office so that they issue some advice to the shopkeepers. Sai is everything to us and it’s really very painful to see this kind of activity. I don’t blame all of them atleast the one who is doing can stop it. Very nice experiences and feelings Mrs.ashalatha. I just got immersed in the narration and felt as if I am there where ever you went in Shirdi. If we are overwhelmed by any thing,any incident, any idol,any Bhajan,any devotional ritual,etc,that too by SAI BABA as devotees,we do not exist during that overwhelming period and beyond as well.This is in line with what Jaggi Vasudev garu(A great mystic and yogi soul) says.During that time ,during those moments,we feel blissful.during those moments,we or I will not be there.It dissolves into BABA.Then BABA and we become one.That is what BABA wanted from us.